Yum Yum Cupcake Truck was among one of the first gourmet food trucks to show up in Orlando. As their name implies, they specialize in cupcakes. Yum Yum can generally be found at the Food Truck Bazaars as well as other food truck events around town. I tried one of their peanut butter cupcakes at the Lake Lily Food Truck Pod. This salted caramel cupcake, topped with caramel popcorn, came from the very first Food Truck Bazaar in Casselberry. Follow The Yum Yum Cupcake Truck on Twitter @YumYumTruck_FL to figure out where they are located. Downtown Pizza is a restaurant in the historic section of Downtown Melbourne. This tiny shop doesn't exactly have an inside and pizza is ordered from a window on the street. The weird thing is, nobody knows what I'm talking about if I mention Downtown Pizza. Regardless of the signage outside and having their own storefront, people seem to refer to this place as Off the Traxx, which is the connected bar located next door. Perhaps if I went to Off the Traxx for drinks before pizza I'd be referring to this place this way too, but why do that when I'm coming for some really good pizza by the slice? 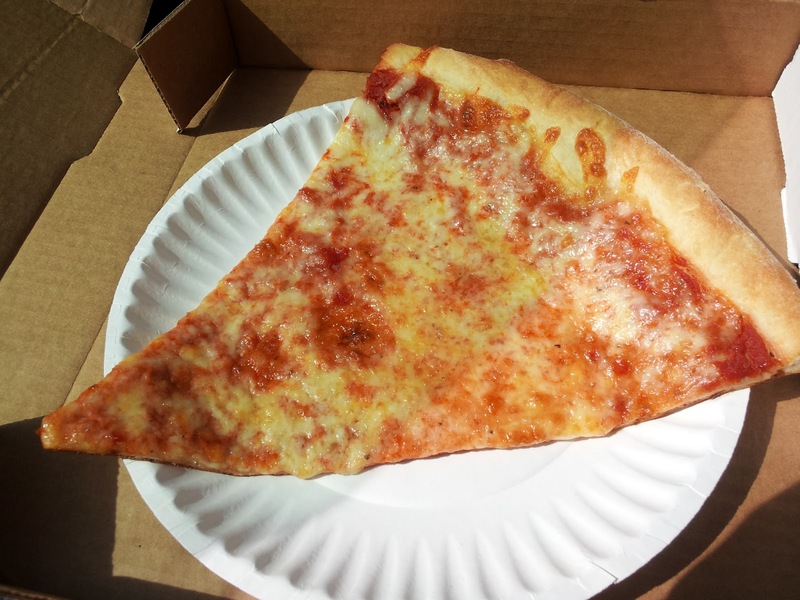 The slices from Downtown Pizza are good sized with a really thin, crispy crust. The sauce and cheese always seem to have a good ratio, and are overall cooked to perfection on my visits. The white pizza is also really good, with no sauce and big pools of ricotta cheese. This continues my trend of finding exceptional pizza in Melbourne. 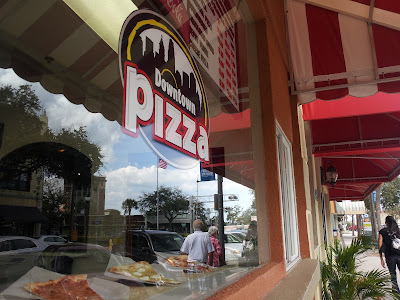 Still haven't figured out why this area of Florida seems to have a disproportionate amount of good, NY style pizzas as opposed to Orlando where pizza seems to be disappointing more often than not. Old Skool Pizza and now Downtown Pizza. I wonder what good pizza will be discussed on this blog next? I have been to Aunt Catfish's On the River in Port Orange a few times. On each visit, the restaurant always seems like they have a wait and the food has been consistently good. 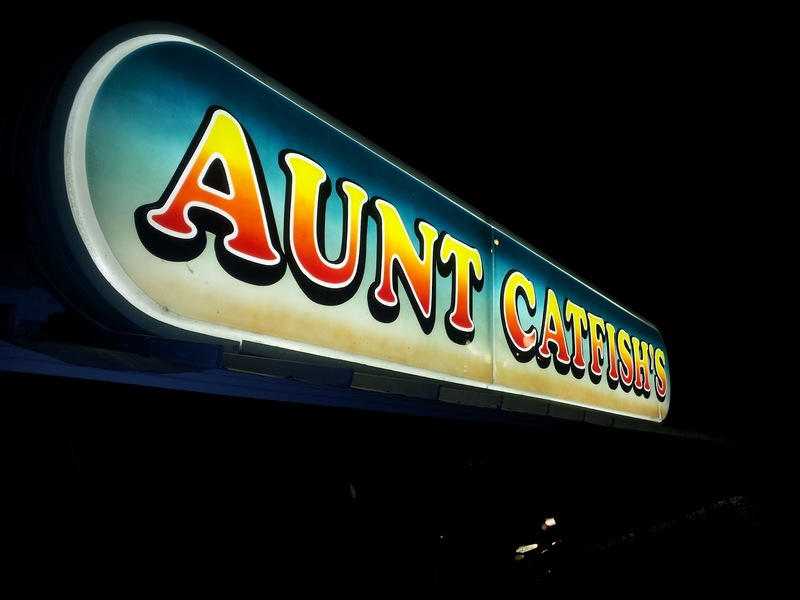 My latest visit to Aunt Catfish's happened on a cold night in January. The meal started with a trip to their Fixins Bar. Almost all meals at Aunt Catfish's include at least access to the food here, if not their salad bar as well. The Fixin' Bar is a small buffet table that includes cheese grits, baked beans, two types of cole slaw, apples, and corn bread. Being able to stuff yourself on all-you-can-eat baked beans so you're full before the actual meal is served can be a bad thing, but is still enjoyable on occasion. The food here was all tasty, especially the cheese grits and the cole slaw. I had the Cajun catfish for my meal. At a place called Aunt Catfish's, I figured I might as well eat the namesake. Two filets of fish were served with a lemon slice and cinnamon roll on a huge fish shaped plate. I think this heart-shaped, cream filled doughnut from Dunkin Donuts in Longwood is probably an appropriate food item to post for Valentines Day. Have fun facing the crowds as you try to eat out tonight! A new self-serve frozen yogurt place opened in Lake Mary several weeks ago. For their grand opening, they mailed out flyers advertizing free frozen yogurt on a certain night. Events like this can result in crazy crowds, but I decided to check them out anyway. The line was out the door, and it ended up taking about a half hour to get my yogurt. They had a large selection of flavors including lots of seasonal flavors like pumpkin pie and egg nog. I did find it interesting that with all of their flavors, Orange Leaf didn't have any of the plain tart frozen yogurt. I ended up trying a little of each flavor, topped with various items including fruit, cheesecake, sprinkles, etc. I'd definitely return, especially after they offer an event like this and give free frozen yogurt to several hundred people. Casa L'Italien is a little restaurant in the same shopping center as Doris' Italian Market in Boca Raton. Besides pizza (which I hear good things about), I thought the menu was somewhat limited and prices were unusually high for the food served.That being said, I ordered an Eggplant Banzini. This was basically your standard eggplant parmesan hero with the addition of ricotta cheese. It tasted good and was a good sized sub.